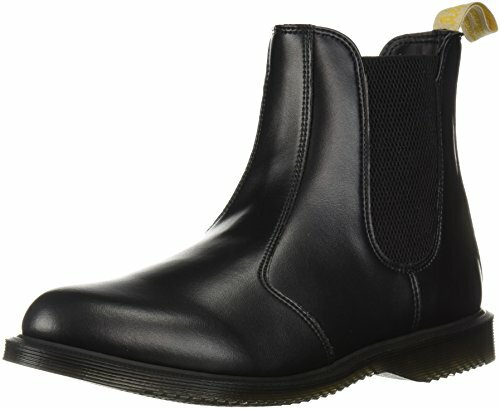 Looking for a fashionable pair of vegan black boots to buy? You're sure to love these cruelty-free picks with a variety of styles to choose from. 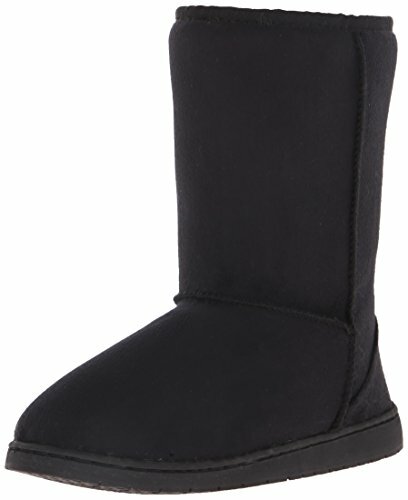 Ladies, get comfy and warm this winter with these super soft faux shearling winter boots. Pros: Inexpensive with a thick microfiber lining and a slip-resistant rubber sole. 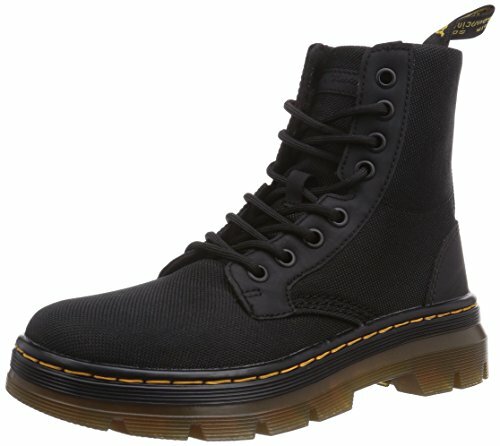 Durable and classic men's combat boots by Dr. Marten's, so you know they'll last a lifetime. Advertised as vegan: No, but they're described as "100% textile." Pros: Slip-resistant with an air-cushioned sole. Cons: Somewhat pricey, no half sizes. These shimmery women's sock booties have comfort and glam in spades. Advertised as vegan: No, but they're made of man-made materials. Pros: Very comfortable and affordable. Cons: May run a half-size or so large. 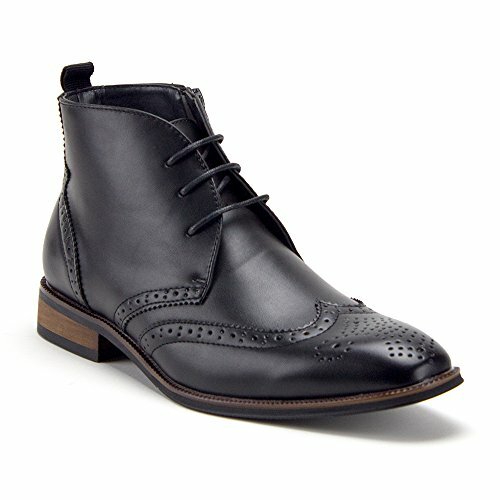 For formal footwear, these stylish wing-tip boots are selling for relatively little money. Advertised as vegan: Yes, in the description, which says "vegan materials." Pros: The cushioned footbed should add comfort, and the side zipper plus lace-up front should make these boots easy to put on without sacrificing a snug fit. Cons: Seem to run large. 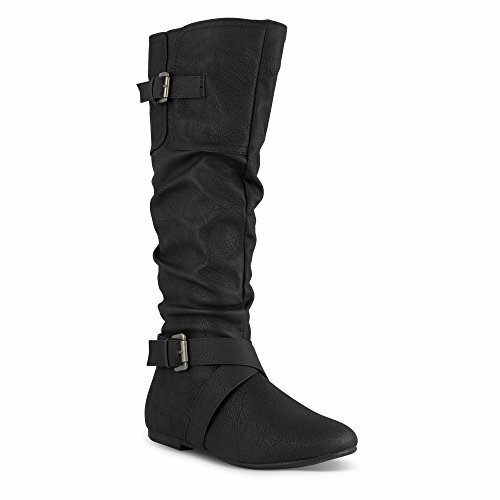 A relaxed slouch lends a laid-back flavor to these high-fashion women's mid-calf boots with stylish buckle cross-strap accents. Advertised as vegan: No. The product description lists synthetic materials and faux leather. Pros: They look like real leather boots with a rubber sole for good traction. Cons: May run a bit small and stretch in the calves with wear. 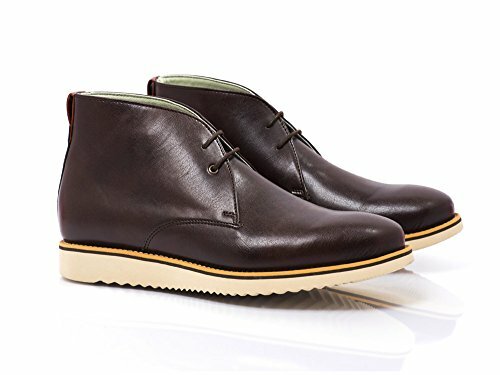 These handcrafted, eco-friendly men's black desert boots can be dressed up or down with a sleek, sophisticated body and casual wedge soles. Pros: PVC-free vegan leather, comfortable natural latex insole and waterproofed body. Toms is known for giving a pair of shoes to a needy child with every shoe purchase, so these women's microfiber wedges are trendy and charitable. Advertised as vegan: Not as such, but they boast "vegan-friendly construction." Pros: Durable with a cushioned footbed and perforated lining that are meant to give comfort and breathability. These Toms are slick, but be sure to stick with Black Heritage Canvas on Crepe if you like these boots (the Toffee Suede option is not vegan). Advertised as vegan: The Black Heritage Canvas on Crepe is advertised as having "vegan-friendly construction." Pros: Cushioned footbed, soft micro corduroy lining and good traction. Cons: May need to wear in a bit for better slip-resistance. With subdued shine, these vegan leather chelsea women's boots come with the Doc Martens reputation for comfort, practicality and style. Pros: Air-cushioned footbed, slip-risistance and versatility — good for workwear and streetwear. Cons: Expensive and no half sizes available. They also take several weeks to wear in for comfort. The Fitzsimmons Treklite boot is made to negotiate city and moderate country terrain with comfort and tons of tread. Pros: Waterproof and long-lasting with heavy-duty tread, micro fleece lining and a comfortable foam insole. Cons: Some reviewers find that they run small and require added arch support.